The Olivier Award for best director has been renamed the Sir Peter Hall award after he was left out of the tribute segment during Sunday's ceremony. The Society of London Theatre (SOLT) said it "apologises unreservedly for this serious error", adding that Sir Peter "was a giant of British theatre." It is now reviewing the process by which people are included in the In Memoriam section for future ceremonies. SOLT has also updated its In Memoriam video to include Sir Peter. The founder of the Royal Shakespeare Company and former National Theatre director died in September, aged 86. Olivier Awards 2018: What else happened? The SOLT said the omission was accidental and that Sir Peter is "sorely missed in the industry". 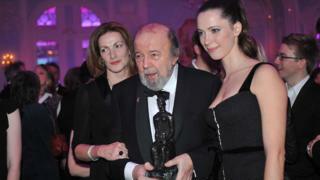 In a statement, they said: "In recognition of Sir Peter's phenomenal contribution to British theatre over many decades, and in close consultation with the Hall family, SOLT has taken the decision to rename the Olivier Award for best director the Sir Peter Hall Award for best director from next year's ceremony and in perpetuity thereafter." SOLT has also added dancer and choreographer Scott Ambler, who died last month, to the In Memoriam video after he was also omitted. Olivier-winning choreographer Sir Matthew Bourne had said the original omission of Sir Peter was "unforgivable", while actor Christopher Biggins called it "disgraceful". Sir Matthew and others also expressed regret that Ambler was not initially included. The In Memoriam segment came midway through the ceremony, held at the Royal Albert Hall in London and subsequently broadcast on ITV. Film actor Sir Roger Moore, US pop star David Cassidy and RSC co-founder John Barton were among those whose names and faces were projected on a screen. Yet there was no mention on the night of Sir Peter Hall - a man the SOLT called "a peerless British director and theatre impresario" when he died last year. "@OlivierAwards could you please explain why Peter Hall was not included in the list of people we have lost this year?" wrote his daughter Emma.